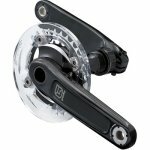 FSA Gravity Chainsets have Hollow Forged crankarms result in superior strength and stiffness and a higher strength-to-weight ratio compared to solid arms. Features: Integrated megaExo Quad BB, Patented chromoly pedal inserts, AL7075T6 spider, Polycarbonate bashring, Heat treated chromoly inner chainring, AL7075T6 middle chainring, Chromoly chainring bolts, BCD: 104/64mm, Chainline: 50mm(68mm BB), 57.5mm (83mm BB), Hi-polished black anodised, Proprietary double row cartridge bearings, Oversizedsplined integrated chromoly BB axle, MegaExo alloy bearing cups, 24mm axle, BB cups: 68, 73, 83mm, Weight(g): 1230 incl. BB. Chainrings: Double.